Diverticular disease and diverticulitis are related digestive conditions that affect the massive intestine (colon). In diverticular disease, small bulges or pockets (diverticula) increase inside the lining of the intestine. Diverticulitis is when these pockets become inflamed or infected. 4.0 out of 5 starsValuable content. It is extremely helpful book, which can give you a lot of instructive information about different diseases and some methods to heal them. Of course, the book can't be the only source of information and you still have to visit qualitative doctor, but it can give you some really helpful tips. Thanks to this book, you will know your organism better and you will be able to improve your health, following the diet, which is described in book. To be honest, I think, this book is almost necessary "tool" now. I am grateful to the author. 5.0 out of 5 starsWell instructed. 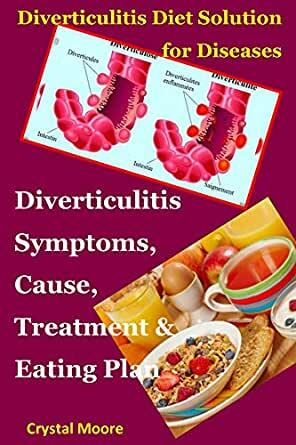 The author has provided a complete understanding of Diverticulitis and step by step has been shown how to take care and treat this if it occurs any troubles or anxiety. I have got this book for my uncle but couldn't resist to read it by my own, and i think this can be a helpful resource guide to get a proper diet and treatment to cure it's effects. Excellent!! I have this book for my uncle yet couldn't avoid to peruse it by my own, and I figure this can be a useful asset manual for motivate a legitimate eating routine and treatment to fix it's belongings.